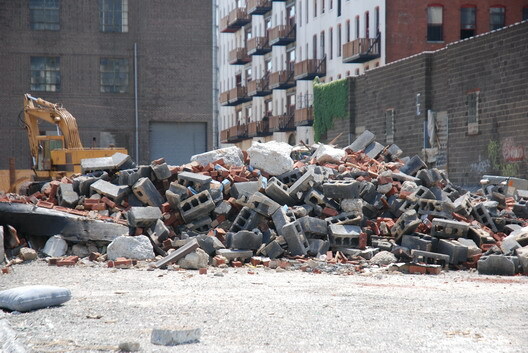 We keep returning to these properties whose official addresses are 157 and 173 Kent Avenue and 224 Wythe Avenue because the demolition process of both the cement plant that originally occupied the site and the building you see reduced to rubble above, has been so weird. About 2/3 of this full block in Williamsburg--across the street from 184 Kent and Northside Piers--is owned by the Chetrit Group. Some of the early demolition appeared to have been done without permits and, now, it's been done without a fence. We know: picky, picky. Anyway, to recap: A full fence went up. Then, it was taken down, making the full lot quite the spot for photo shoots. 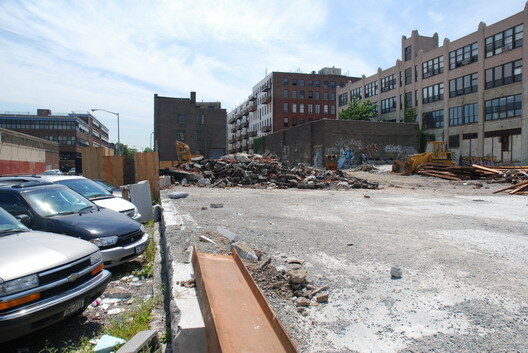 Since then, work's been going on with a partial fence around the site making it one of the most wide-open sites we've seen anywhere in Brooklyn. We can only assume the Department of Buildings approves wholeheartedly, because this has been going on for months. I normally enjoy this site without comment, but for a site that is supposed to follow construction and development I should make you aware that 'cement' is only one ingredient in the building material called 'concrete'.